May is Asian Heritage month. Toronto has displays of art and photography at Metro Hall then City Hall. In May 2018. During the summer of 2018 Erik participated in shows at the Urban Art Gallery at 400 Queen St. E. Toronto ON M5A 1T3. Erik participated in a group show Art Square Gallery 334 Dundas West, Toronto On, M5T 1G5 across the road from the Art Gallery of Ontario. Be there or be square! July 2017 Erik participated in a group show at the Urban Art Gallery at 400 Queen St. E. Toronto ON M5A 1T3. The title of the show is “O Canada” celebrating the 150th birthday of Canada. The gallery has selected Erik’s painting ” Beautiful Day ” with our National Anthem in English, French and Inuktitut in it, to use as this show’s promotional material. Erik is extremely honoured by it. June 30th to the end of July 2017 Erik had some other artworks in another group show at the Stockyards Gallery at 1611 DuPont St. Toronto ON M6P 3S8. The group show is titled “I Love Canada”, which is also celebrating Canada’s 150th birthday. June12th – June17th, 2017 to celebrate Canada’s 150th Anniversary. 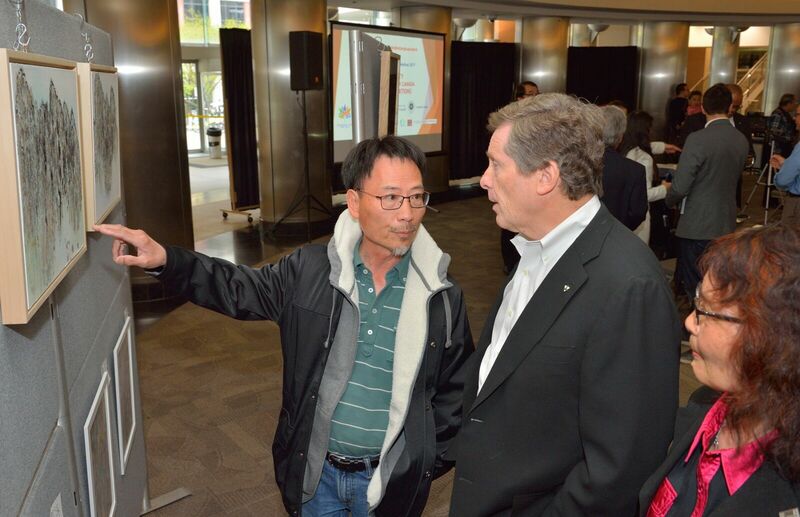 Erik with other artists participated in the Asian Heritage Month art show at Toronto Metro Hall. There he had on display his “The Land of Five Elements” painting. This years theme was Unity in Diversity, Fusion of Communities in Canada. Erik also had the pleasure of talking to Toronto’s mayor John Tory about his paintings. Erik donated a painting titled The Six Phenomenon to their yearly fundraiser. This year once again Erik donated an abstract painting to Fife House called Let’s Dance. Fife House held a “Spotlight” event on October 11 2016 at the Danforth Music Hall. At the event they had a silent auction for which bids were made on all of the donations. Some lucky bidder got Erik’s painting. Erik showcased his new painting at the Urban Gallery Group Exhibition, from August 4th 2016-August 31st 2016. This years exhibition was called “Visions of Toronto”. Erik created a piece called “The Six Phenomenon”. Using cold wax and oil as a medium on a wooden panel. 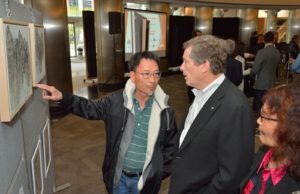 May is Asian Heritage Month in Canada, During the month Erik, with other artists had a showing of some of his new pieces of art in an exhibition held at Toronto City Hall. The grand opening ceremony was held at 7pm on Friday May 13th 2016. The following weekend there was another show held at Metro Hall on John Street, in Toronto, near the CN Tower. Erik’s artwork ” Beneath The Grid”, was selected by a jury from the Station Gallery in Whitby for their show called: Secret World. It runs from November 28th 2015- January 10th 2016. You can see Erik’s art there, along with many other artists. Every year Erik donates a painting to Fife House of Toronto for their spotlight silent auction. Which is held November 27th 2015, at the Glenn Gould studio. The painting he donated this year is called “Alpha State of Mind”, was well received. May 17th – 22nd, 2015 at Metro Hall in Toronto on King St. W. at John St. Celebrating Asian Heritage Month. This years theme is Here/Now/Mindfulness/Emptiness. Erik’s calligraphy inspired abstract painting called “Dream”, was selected for the juried exhibition at the Station Gallery’s Slice of Life exhibition in Whitby, Ontario. It will be on view at the gallery from November 29th 2014 – January 11th 2015. Erik’s debut solo exhibition, called Shifting Borders: Seen and Unseen, at the Urban Gallery 400 Queen Street East, Toronto that ended January 10th 2015, was a great success. Everyone loved his work that attended, with many picking out their favourite pieces. Most chose as their favourite the piece entitled “Emperor’s Cloth”. Erik showed some unique pieces of work. With different takes on urban landscapes, and Chinese calligraphy in an abstract manner. For which Erik is well known for. Erik donated an abstract painting to Fife House called “In Through The Grapevine”, for their annual fund raising event. Which was held at the Glenn Gould Studio at CBC Headquarters. To the delight of the fundraisers his piece sold at the silent auction. Art of Food at the Urban Gallery, Toronto September 2014. Celebrating the art of food, Erik and several other artists all with their own unique styles participated in this exhibition. At the opening Art reception many people loved his take on his piece titled “Fiddleheads”. Which are a vegetable commonly in the spring time in the Canadian Maritimes. OCAA Group Exhibition, Toronto. September 2014. Along with several other artists contributing pieces in celebration of the Chinese National Holiday. Metro Hall Toronto, May 2014. For Asian Heritage Month in Canada Erik and 4 other Chinese artists put on this exhibition. Erik had several pieces on display which were loved by all. There was also a live performance featuring song, dance and tai chi. The lucky members of the audience thoroughly enjoyed the exhibition, and participated in it, leaving with a piece of original artwork. Station Gallery Whitby, Drawing for Art. April 2014. Erik participated in this exhibition with several other artists. Erik regularly participates in exhibitions at the Station Gallery since 2010. Where one of his pieces called “Love” was selected by a jury for an art exhibition.